Seagate and Las Vegas Sands’ dividends could be unsustainable. With interest rates near historic lows, high-yielding dividend stocks have become more lucrative income investments than bonds. Many investors also believe that those yields should offer decent downside protection if the market dips from its all-time highs. But investors shouldn't chase high yields without regard for valuations, earnings growth, and payout ratios. By doing so, they might invest in companies which have no way to support their big dividend payments. Let's examine two companies which fit that description, and why they could slash their dividends soon. Hard drive company Seagate (NASDAQ:STX) pays a hefty forward annual dividend yield of 7.4%. It's raised that payout every year since it introduced the dividend in 2011. Unfortunately, that payout consumed 293% of its earnings and 67% of its free cash flow over the past 12 months. 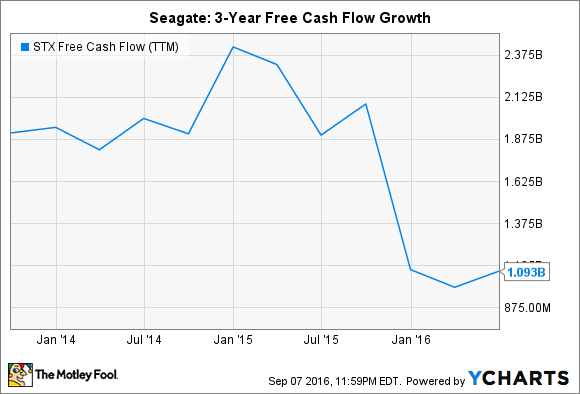 That payout ratio looks sustainable on a free cash flow basis, but Seagate's FCF growth has been in a clear downtrend over the past three years. That's because demand for its core HDDs (hard disk drives) is drying up as PC sales decline and users upgrade to SSDs (solid state drives). SSDs offer less storage than HDDs for the same price, but they're smaller, faster, consume less power, and don't have any moving parts which are prone to damage. Seagate lags far behind market leaders Samsung and Western Digital's (NASDAQ:WDC) SanDisk in the SSD market. Analysts expect Seagate's sales to fall 6% this year, but its aggressive stock buybacks are expected to boost its earnings by 32%. Seagate spent over $1 billion on debt-funded buybacks over the past 12 months. Between its high dividend payments, slowing FCF growth, and big buybacks, there's simply no room for Seagate to invest in its future with big acquisitions like WD's $19 billion purchase of SanDisk. When Seagate's cash flows dry up and it runs out of ways to inflate its earnings, a dividend cut will likely follow. Casino operator Las Vegas Sands (NYSE:LVS) pays a forward yield of 5.3%, and it's raised that payout annually since it introduced the dividend in 2012. But over the past 12 months, those dividends have consumed 191% of its earnings and 149% of its free cash flow. 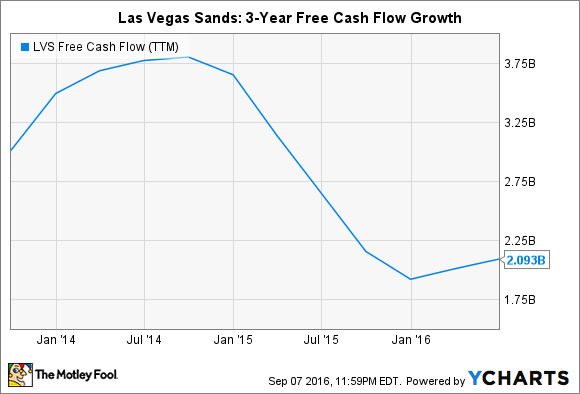 Las Vegas Sands' FCF has also declined considerably over the past three years. Las Vegas Sands' troubles all stem from Macau, which generates the lion's share of its revenues. Macau, the only city in China where gambling is legal, was once considered the next growth market for companies which had run out of room to grow in Las Vegas. However, tighter regulation of casinos and junket operators, a crackdown on corruption in China, and an economic slowdown across the country all caused Macau to lose its luster. Monthly gambling revenue in Macau only recently returned to year-over-year growth in August with 1.1% growth following a two-year long decline. The bulls believe that rebound, along with the opening of the Parisian Macau this month and robust growth on the Las Vegas Strip, can strengthen Sands' cash flows and reduce its payout ratios to more manageable levels. But the bears believe that Sands' payout ratios are simply too high, and that it will likely need to reduce its payout like Wynn (NASDAQ:WYNN), which slashed its dividend by 67% a year ago. After all, analysts still expect Sands' revenue and earnings to respectively fall 4% and 14% this year -- hardly ideal numbers for dependable dividend growth. Instead of chasing high yields, investors should carefully analyze a company's payout ratio, free cash flow, and earnings growth. If the first number is above 100% and the other two numbers are declining, it's likely that a dividend cut is in the cards.